Thanks for stopping by to see even more of what’s new with the latest products from the June Release. Today I thought I’d share something for the boys! All too often they are left out, and forgotten. I’m happy to say that the last couple of months we’ve added to our product line with boys/men in mind, with more to soon follow. Now that you’ve seen some of the latest additions let me get to my project! As you know I’m all about coordination. That is what brought me into the paper-crafting world in the first place. First it was creating cards to match my gift wrap I had bought in the store, and then it turned into making my own gift wrap for my creative projects, from start to finish – 100% handmade! One thing turned into another and now I do what I love. The best part about that is that others love doing it too, and the feeling I see come over the people I gift these handmade gifts to makes it even better. So for my next homemade gift! So this time my project is for my son Noah. The NEW! Got Game? set was designed with him in mind. He is a HUGE video gamer. HUGE! He’s been playing since he was almost 3. Crazy, I know, but his daddy loves video games too! So as they say the apple doesn’t fall far. So to package up one of the games on his list I created a gift box using the NEW! Disc-Covered Pretty Packaging Template. Personally for me, the need for this particular packaging is what spurred the design of this template combination, intentionally making it a bit larger to suit other gifts ideas to offer some versatility. 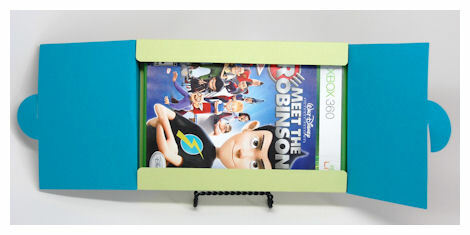 I love the interlocking lid panels too, as that offers a fun way of presenting these gifts, in an unexpected way. I got inspired with colors from an older collection of paper: Shopping Shirley’s © Nomad’s Teal Leaf, which has paper that coordinates perfectly with the NEW! Got Game? set. The images from that paper come from the Money Well Spent © set, and match this new set, like no other! I took the colors from the Shopping Shirley’s © Nomad’s Teal Leaf, into my photo editing software to re-color my NEW! Pop Some Fun! Pretty Printable Digital Paper, which is where the star patterned paper on this project came from!!! Now it is a perfect match. I love being able to do that, so my project is sure to match what I am doing every time. I also love not needing to worry about running out of any particular pattern any more. When you can print your own you have a endless supply! I use to hoard and save my favorite patterns. OK now the details of this…. 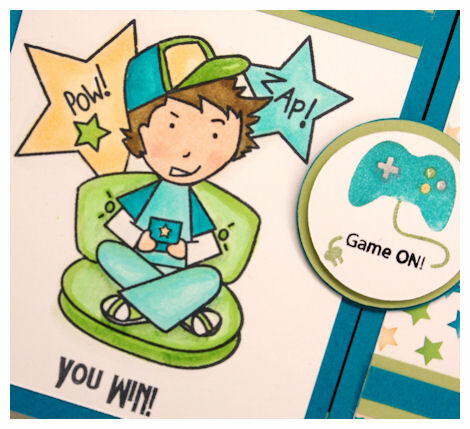 The game controller comes from the Money Well Spent © set, and like the paper, it was a perfect match to the NEW! Got Game? set. Now for my image, I hand colored it with my Copic markers. I always print my paper first, then color after to ensure a great match. I love the opportunities that the digi images afford me. I can make them as big or small as I want. I can digitally color them, or hand color, I can flip them, remove parts I don’t want…like on my card! Can you see I removed the stars from the background of my image, and my image is obviously smaller than the one that is on my NEW! Disc-Covered template. 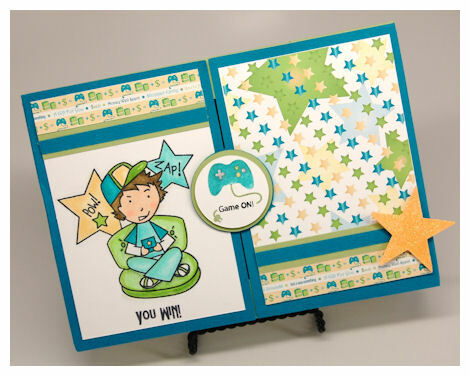 I used the same papers on my card, as my template, and intead of having a 3 D star, like on my template, I used the star sentiment from the SK8R Boy © set instead. So I added the highest score sentiment to the lower left corner, and added the score. I used a variety of numbers for Noah which is is coming age: 9 then his birthday 11-13-02. Just a fun way to add a “score”. If you were making an invitation with this set the party date, address or childs age would be perfect there! So that is all for me today. Hopefully you’ll have time to stop by tomorrow because we aren’t done with the ideas yet!